The launch of the new biography David Nixon: Entertainer with the Magic Touch by Edwin A. Dawes and Stephen Short was celebrated at The Magic Circle on Monday, November 30th, with a special lecture and show attended by members of the Nixon family. David Nixon’s wife Vivienne, son Nicholas and daughter Mandy were among the Nixon family members attending the event, which started with a lecture by Eddie Dawes on the man described as ‘the father of magic on television’. A tribute show followed with performances of tricks closely associated with Nixon’s career featuring Chris Woodward, Terry Seabrooke, Fay Presto and Colin Rose. 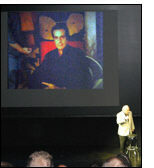 Alan Shaxon, who tore and restored a newspaper strip, recounted how an appearance on the Nixon TV show kick-started his professional career and Peter Scarlett concluded the live action with Nixon’s signature card in cigarette routine. Film clips included ‘Dizzy Limit’, the transposition with Anita Harris, and many clips of the sadly missed Ali Bongo who acted as magical adviser to David Nixon in the 1970s. David Devant Award, posthumously to Ali Bongo. Cecil Lyle Award for best trick in The Magic Circular to Tim Sutton. John Nevil Maskelyne Literary Award to Chris Woodward. Maskelyne Award to Terry Seabrooke. 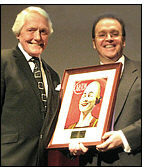 Carlton Comedy Award to Noel Britten (announced at a later date). Silver Wands to Jack Delvin, Alan & Barbara Astra, Keith & Carol Cooper.